With Brazil and its international perception so topical post-World Cup, it’s perhaps the perfect time for IMMA to host this look at one of Brazil’s most influential modernists. It’s definitely easy to see why they picked its opening to coincide with their Summer Rising festival – the sunny colours and interactivity make a welcoming combination. There’s even a real live parrot. Born in Rio de Janeiro in 1937, Oiticica was affiliated with various art movements like Grupo Frente and the Neo-Concrete group. Clido Meireles is perhaps the more famous artist of this group – the Coke bottles he used to circulate messages of political protest as part of his Insertions Into Ideological Circuits (1970-76) are in the Tate Modern’s permanent collection. However, this first showing of Oiticica’s work in Ireland makes a strong case for his contemporary and historical importance. Interestingly, IMMA have prefaced Oiticica’s work with a selection of pieces intended as a “complement to and expansion on” some of the major interests of his career – namely, strong colour, movement and participation. This leads us on to a selection of his early paintings – an underrated aspect of his work, but well-represented here. Perfectly balanced, geometric compositions in strong colours, I wouldn’t be surprised if they’d influenced Saul Bass’ famous movie posters. However, Oiticica quickly moved on from traditional abstract painting. Perhaps the most striking aspect of his mature work was his attempts to free colour and form from the flat painted surface to become three- and even four-dimensional, playing out in both space and time. Here this is represented by Spatial Reliefs . These are large-scale hanging arrangements of flat colour planes in his signature earthy yellows and red. The impression is almost of an abstract expressionist work exploded in all directions – other common comparisons are to Malevich and DeStijl. But Oiticica’s work is much more vibrant, alive and enticing. We’re invited to step into one wardrobe-like sculpture and move around through sliding doors, the colour and shape of our environment changing as we do so. It blurs the lines between painting and performance, embodying his idea of ‘totalidade-côr’ (total colour). This exploratory quality is another common theme in Oiticica’s art. He saw the Western art tradition as placing too much emphasis on the visual while neglecting real, physical experience. Hence the invitation here to step into, interact, move through, explore. Even the layout of the exhibition reflects this as we wander from one room to the next, a surprise around every corner. 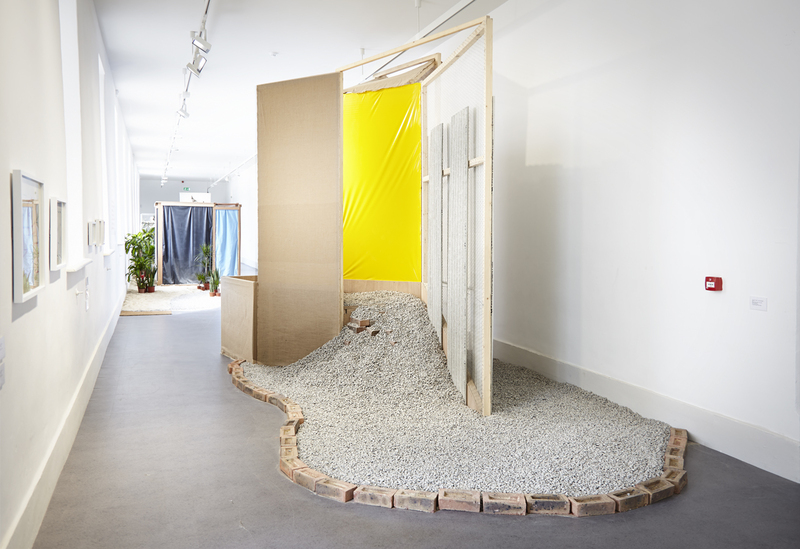 The centrepiece of the exhibition, Tropicália, leads the visitor on winding paths up and around structures reminiscent of the favelas, from bright tropical colour into warm darkness. 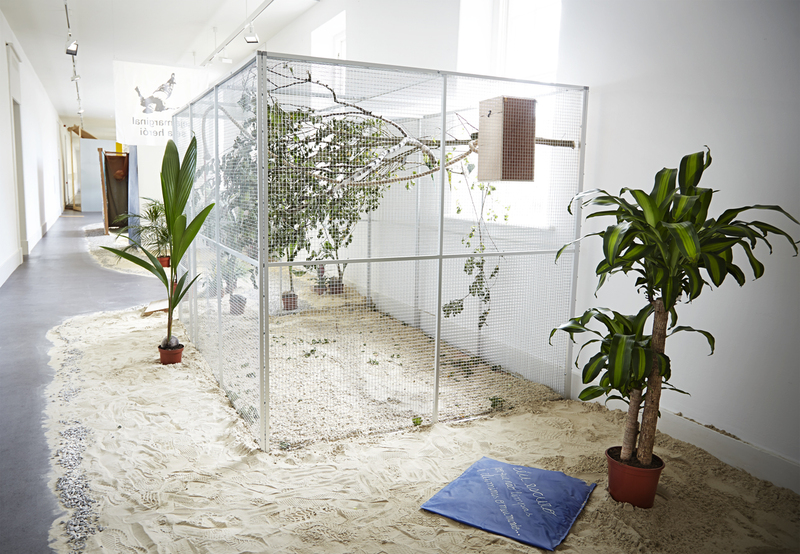 The floor is strewn with sand and rocks, with tropical plants dotted around the room. It’s all very stereotypically ‘Brazil’, missing perhaps only mardi gras beads and soccer balls. But the TV set hidden away at the centre of all this deliberately stereotypical tropical staging underlines its hollowness. It seems to suggest that these houseplants and caged birds and sandy gallery floors can never fully capture the real experience of Brazil. Oiticica is challenging the idea of a Brazilian culture that could be summed up in a single image – as he wrote,“the myth of ‘tropicality’ is much more than parrots and banana trees”. So influential was this work to young Brazilian artists when first shown in Rio de Janeiro’s Museum of Modern Art in 1967 that it gave its name to an entire art movement – Tropicalismo. Elsewhere, the work becomes more purely tactile. We drape ourselves in the Parangolés (capes inspired by samba dancers) and fight through jellyfish-like rubber tendrils that fill half a room. There are coffee beans to scoop out of tubs of water and rubber gloves to wear while touching wet sand. An entire room is lined with cushions. It’s like a grown-up playground (but take your shoes off first, as I was warned by a passing small child).